Braid Amateur Boxing Club welcomed a knockout visitor – former world champion Barry McGuigan – to its Ballymena clubrooms last week. The former world featherweight champion-turned-promoter created a real buzz when he visited the club’s Ballykeel base. “Braid ABC was set to host a visit last year to mark the club’s 10th anniversary, that visit had to be postponed and we had felt that the visit would not take place,” explained Braid head coach John McLeister. Barry spent time with the coaches and the boxers and watched as club Boxers Corey Bradshaw, Anthony O’Rawe and Chris Richmond sparred boxers from the Canal Boxing Academy in Lisburn. McGuigan, who now trains and promotes world bantamweight champion Carl Frampton, was on hand to give the boys tips and advice during the workout and spoke highly of the talent on display. Former Ulster bantamweight Senior Champion Anthony O’Rawe was one of the boxers Barry spent time with and clearly saw the potential that he has. Corey Bradshaw a 16 year old champion welterweight boxer also had Barry in his corner and Barry described Corey as “something special” which will give the local boxers a great lift. “Barry spent more time with the boys than any of us anticipated, it wasn’t long before he had the coaching pads on and was drilling instruction to Anthony on the pads, whilst watching Corey and Chris sparring,” said Mr McLeister. A presentation was made on behalf of the club by its youngest member, Jamie Beverland from Cullybackey. Barry was in no hurry away and openly discussed Carl’s training and sparring programme and informally shared memories of his early career and encouraged the boys to stick at it and train hard. “It was great to be in his company and I know the lads were very inspired by the visit,” said John. “Ian Paisley, who co-ordinated the visit on behalf of the club and who has always been a fervent supporter, spoke highly of the club which is always good to hear. “The club is only too grateful to both Ian and Barry for spending time in our Club and with the team,” added John. Ian Paisley MP was in attendance at the Adelaide Motorbike Awards Dinner this week at the Ramada Hotel in Belfast. 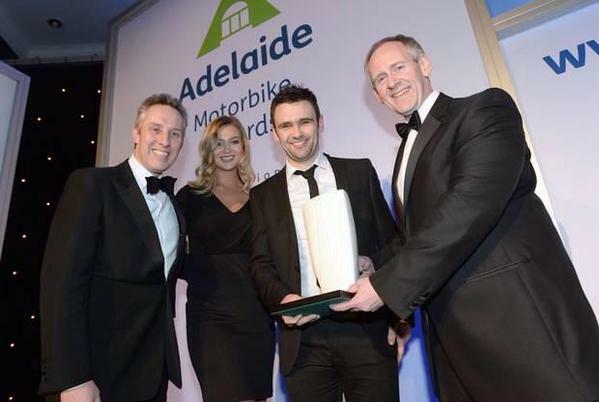 The MP helped present William Dunlop the Race of the year award. “As a keen motorcycle enthusiast myself, I was delighted to be invited to attend the Awards dinner” said Mr Paisley. Ian Paisley Junior MP has welcomed the impact that the Irish FA and McDonald’s Community partnership is having on grassroots football following a visit to two of the biggest clubs in the North Antrim constituency, Ballymena United FC Academy and Ballymoney United FC Academy. McDonald’s has a long standing commitment to grassroots football, having been the Community Partner of the Irish FA since 2002. This partnership is delivering a lasting legacy for grassroots football through McDonald’s KickStart funding, ongoing coach creation and education, a Club Accreditation Scheme and its regional Small Sided Games Centres – all contributing to ‘Better Play for Kids’. The McDonald’s Irish FA Community Awards also build on the continued commitment of McDonald’s to improve standards of community football and to increase participation across all aspects of the game. 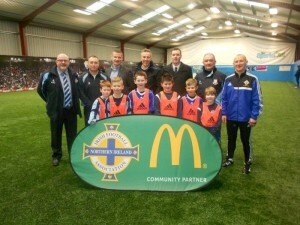 Nominations are currently open at www.mcdonalds.co.uk/KickStart or www.irishfa.com/communityawards and people are encouraged to follow the McDonald’s Irish FA Community Awards on twitter @2014Grassroots. North Antrim MP Ian Paisley and Olympic hero Jonny Brownlee welcomed children from schools from around the country to the 100th Tata Kids of Steel Triathlon at the Terrace Pavilion of the Houses of Parliament today. In the first triathlon event ever to take place in the Houses of Parliament, kids from around the country as well as many others from around the country swam, cycled and ran to help Tata Steel towards their target of completing an Olympic-length triathlon in an hour and a half. Olympic bronze-medal triathlete Jonny Brownlee and Paralympian Lauren Steadman attended the event, providing much appreciated training tips and advice for the junior triathletes. The success of Team GB triathletes at the London 2012 Olympic Games was a massive boost to the sport of triathlon in the UK, inspiring the next generation of triathletes to be more involved and active in the sport than ever before. Tata Steel and the British Triathlon Foundation, the sport’s charitable arm, collectively aim to introduce youngsters to the sport and encourage them to take it up. Zara Hyde Peters OBE, CEO of British Triathlon Federation and Trustee of the British Triathlon Foundation Trust, added: “We’re delighted to continue to work alongside Tata Steel in this partnership, which has been a big success in our seven-year relationship, benefiting both UK children and the development of our sport. Tata Kids of Steel is a children’s triathlon series organised by British Triathlon in partnership with Tata Steel, with the aims of encouraging children across the country to have a fun, positive experience of sport and of inspiring them to adopt a healthier lifestyle through sport and exercise. This year’s Tata Kids of Steel series has seen more than 8,000 youngsters take up the challenge to each swim, cycle and run part of the distance between London and the next Olympic host city Rio de Janeiro, our way of inspiring a generation to take up sport and to help in securing the 2012 Olympic legacy. 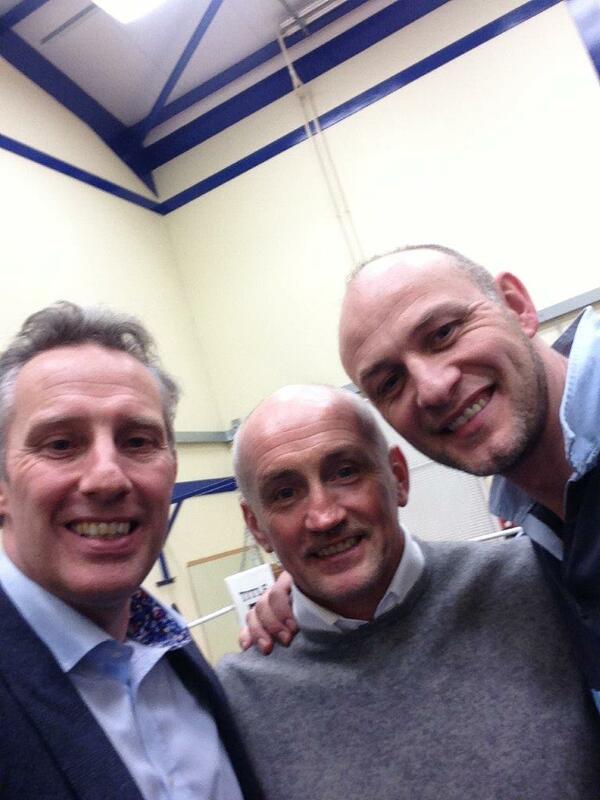 Ian Paisley MP congratulates Michael Dunlop on his haul of Isle of Man TT victories. “What a phenomenal achievement by yet another Dunlop in the Isle of Man TT. Michael comes from a legendary biking family and is quite clearly capable of following the giant footsteps that Joey and Robert laid before him. We look forward in great anticipation to watching Michael’s career unfold and hopefully watching another generation of Dunlop dominate the world biking stage for many years to come. Ian Paisley MP launches Nike, Designed to Move program alongside Olympic medallist Paula Radcliffe in Parliament. The event was aimed at raising awareness of the declining numbers of children who are currently taking part in physical activity across the UK. For the first time in history, today’s children now have a shorter life expectancy than their parents – a startling statistic. Between 1961 and 2005 in the UK, physical activity of the entire population decreased by 20%, with this figure rising as high as 35% by 2030. Alongside this, between 1994 and 2008 the prevalence of obesity amongst adults increased 79% in men and 47% in women, and within children aged 2-10 it increased by 56%. Physical inactivity has been identified as a major risk factor for all causes of mortality, cardiovascular disease, high blood pressure, stroke, type 2 diabetes, metabolic syndrome, colon cancer, breast cancer and depression. The costs of inactivity to the NHS are around £21billion annually. “It was a pleasure to welcome such a distinguished and world famous athlete to Parliament and promote such a great cause alongside her. 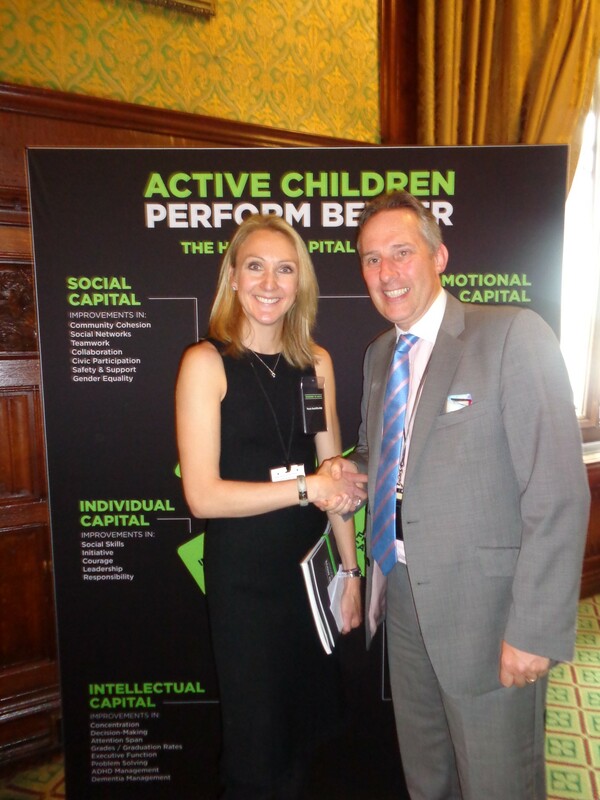 Paula Radcliffe has long campaigned for healthy lifestyles across the UK and it was great for her and Nike to bring their experience to Westminster. Adults and children alike across North Antrim and Northern Ireland should not underestimate the many positive physical and mental benefits from exercising. Not only do you become fitter and less at risk from illness, but it also helps ease anxiety and other issues. Children should be encouraged to put down the computer games and start playing sport. Many life skills, social skills and friendships are formed through taking part in team activities at school. What’s more those who do take part in PE are proven to build bigger networks and perform better in their school work and jobs in later life, not to mention the reduced health care costs as you get older!